Another experiment: running a JeeNode on its internal 8 MHz RC clock while using the crystal input to run timer 2 as an RTC. This would allow going into a very low-power mode while still maintaining a much more accurate sense of time. I didn’t even bother adding capacitors, these are probably not needed with this crystal (same as on the RTC Plug) since there is probably enough parasitic capacitance already. 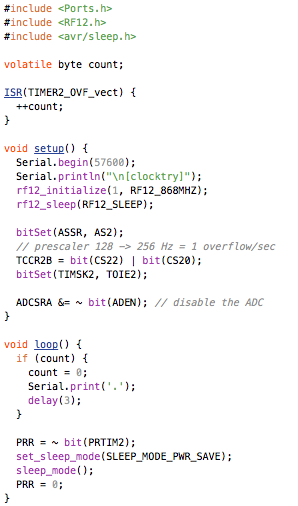 The tricky part is the code, since the ATmega is now running in a not-so-Arduino-like mode. Could almost have used OptiBoot with this setup, but the only internal RC clock build for it is the LilyPad, which has an ATmega168. I ended up using the ISP programmer. IOW, I now compile for “LilyPad w/ 328” and then bypass the bootstrap and serial-upload. Less convenient, but it works. So this setup is working. It draws 4.10 ma, consistent with the recent current measurements: slightly less than with the 16 MHz resonator pre-scaled by two. In idle mode, current use drops to 1.71 mA, not bad! A small adjustment is needed to make sure the serial port is finished before we go into low-power mode, hence the call to delay(3). Hm, power consumption is still 0.67 mA – quite a bit, given that we’re really powering down most of the time. Note that these 1 second interrupts are very accurately timed, more so even than with the standard 16 MHz resonator. This could be used to perform time-domain tricks on the wireless side, i.e. waking up just in time whenever a “scheduled” packet is expected to come in – as described in yesterday’s post. There’s probably more left to try. The delay is running on full power, waiting for the serial output to clear the USART. It could be done while in idle mode, for example. 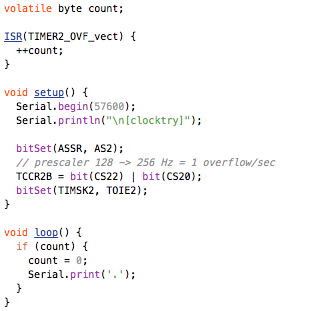 Anyway… that entire delay becomes superfluous when we stop sending out debugging output over the serial port. So there you have it – a JeeNode running at ≈ 8 MHz, with a precise 32,768 Hz pulse feeding timer 2, in a way which supports low-power sketches while maintaining an accurate sense of time. Nice project. I wonder what the long-term stability is? I would guess that stray signals will cause problems, and if you implemented a wall/desk clock it would be way off in a month or so. But I hope I am wrong! There is nothing that interferes with the timer and it generates an interrupt independent from anything else, so it is all up to the precision of the 32kHz crystal oscillator. You may want to tune it with a variable capacitor (trimmer).